Was I Ever Not an Artist? "As a kid, the world was a playground of sights, sounds, colors, textures. A kaleidoscope. It's hard to focus on one thing when there are so many choices." A clue to understanding why Mears works with different mediums -- as an undergrad, understanding different disciplines was mandatory. As a post grad, she focused on painting. A second major, Art Education, required basic knowledge in most other disciplines - clay, printmaking, jewelry making, metal work, etc. Mears got a degree to teach from Kindergarten thru Junior College. She taught for several years in the Junior High grades. 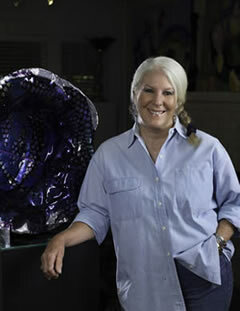 Born in Iowa, a graduate and post-graduate from the University of Iowa, Mears moved to Oklahoma City in the 70's. A lot of travel in the in the 80's in Mexico, the Caribbean, Europe, Crete, Nepal, Tibet, China and Africa introduced diaries of ideas. 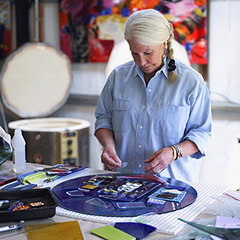 In the 90's she lived in San Francisco for several years and moved to the Colorado mountains before returning to Oklahoma City to make it the studio home base. Traveling didn't diminish work in the studio and added more choices to the canvas of creativity. During the 80's and 90's ceramics was primary. Mears sold over 7,000 15" platters during that time. Each one was unique. She called them 'paintings in the round'. In 2002, Mears started working with kiln formed glass. Working with kilns for so many years made the transition to glass easier but still glass has a steep learning curve. It offers all the artistic and creative elements Mears loved. Once the mechanical part was conquered the possibilities were endless. The excitement and anticipation of opening the kiln never changes. Today, Mears work primarily is with kiln formed glass. Glass, harmonizing with steel, wood or stone. "I still work in other mediums. It's a good stabilizer. It allows my mind to sort out new directions or work out an existing roadblock." Her style is colorful, bold, textural, contemporary. If a word were given to describe her work, it would be 'colorist'. The chosen themes are the mask, nature, archaeology and pure abstraction. "It's a discovery to look back and wonder what the next chapter will be."